Bradycardia is a condition typically defined wherein an individual has a resting heart rate of under 60 beats per minute (BPM) in adults. Bradycardia typically does not cause symptoms until the rate drops below 50 BPM. When symptomatic, it may cause fatigue, weakness, dizziness, sweating, and at very low rates, fainting. During sleep, a slow heartbeat with rates around 40–50 BPM is common, and is considered normal. Highly trained athletes may also have athletic heart syndrome, a very slow resting heart rate that occurs as a sport adaptation and helps prevent tachycardia during training. The term "relative bradycardia" is used to refer to a heart rate that, although not actually below 60 BPM, is still considered too slow for the individual's current medical condition. 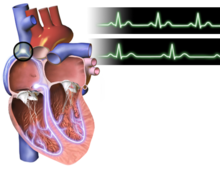 Illustration comparing the EKGs of a healthy person (top) and a person with bradycardia (bottom): The points on the heart where the EKG signals are measured are also shown. Atrial bradycardias are divided into three types. The first, respiratory sinus arrhythmia, is usually found in young and healthy adults. Heart rate increases during inhalation and decreases during exhalation. This is thought to be caused by changes in the vagal tone during respiration. If the decrease during exhalation drops the heart rate below 60 bpm on each breath, this type of bradycardia is usually deemed benign and a sign of good autonomic tone. The second, sinus bradycardia, is a sinus rhythm of less than 60 BPM. It is a common condition found in both healthy individuals and those considered well-conditioned athletes. Studies have found that 50–85% of conditioned athletes have benign sinus bradycardia, as compared to 23% of the general population studied. The heart muscle of athletes has become conditioned to have a higher stroke volume, so requires fewer contractions to circulate the same volume of blood. The third, sick sinus syndrome, covers conditions that include severe sinus bradycardia, sinoatrial block, sinus arrest, and bradycardia-tachycardia syndrome (atrial fibrillation, flutter, and paroxysmal supraventricular tachycardia). An atrioventricular nodal bradycardia or AV junction rhythm is usually caused by the absence of the electrical impulse from the sinus node. This usually appears on an EKG with a normal QRS complex accompanied with an inverted P wave either before, during, or after the QRS complex. An AV junctional escape is a delayed heartbeat originating from an ectopic focus somewhere in the AV junction. It occurs when the rate of depolarization of the SA node falls below the rate of the AV node. This dysrhythmia also may occur when the electrical impulses from the SA node fail to reach the AV node because of SA or AV block. This is a protective mechanism for the heart, to compensate for an SA node that is no longer handling the pacemaking activity, and is one of a series of backup sites that can take over pacemaker function when the SA node fails to do so. This would present with a longer PR interval. A junctional escape complex is a normal response that may result from excessive vagal tone on the SA node. Pathological causes include sinus bradycardia, sinus arrest, sinus exit block, or AV block. A ventricular bradycardia, also known as ventricular escape rhythm or idioventricular rhythm, is a heart rate of less than 50 BPM. This is a safety mechanism when a lack of electrical impulse or stimuli from the atrium occurs. Impulses originating within or below the bundle of His in the atrioventricular node will produce a wide QRS complex with heart rates between 20 and 40 BPM. Those above the bundle of His, also known as junctional, will typically range between 40 and 60 BPM with a narrow QRS complex. In a third-degree heart block, about 61% take place at the bundle branch-Purkinje system, 21% at the AV node, and 15% at the bundle of His. AV block may be ruled out with an EKG indicating "a 1:1 relationship between P waves and QRS complexes." Ventricular bradycardias occurs with sinus bradycardia, sinus arrest, and AV block. Treatment often consists of the administration of atropine and cardiac pacing. For infants, bradycardia is defined as a heart rate less than 100 BPM (normal is around 120–160). Premature babies are more likely than full-term babies to have apnea and bradycardia spells; their cause is not clearly understood. The spells may be related to centers inside the brain that regulate breathing which may not be fully developed. Touching the baby gently or rocking the incubator slightly will almost always get the baby to start breathing again, which increases the heart rate. Medications (theophylline or caffeine) can be used to treat these spells in babies if necessary. Neonatal intensive-care unit (NICU) standard practice is to electronically monitor the heart and lungs for this reason. This cardiac arrhythmia can be underlain by several causes, which are best divided into cardiac and noncardiac causes. Noncardiac causes are usually secondary, and can involve recreational drug use or abuse; metabolic or endocrine issues, especially in the thyroid; an electrolyte imbalance; neurologic factors; autonomic reflexes; situational factors such as prolonged bed rest; and autoimmunity. Cardiac causes include acute or chronic ischemic heart disease, vascular heart disease, valvular heart disease, or degenerative primary electrical disease. Ultimately, the causes act by three mechanisms: depressed automaticity of the heart, conduction block, or escape pacemakers and rhythms. In general, two types of problems result in bradycardias: disorders of the sinoatrial node (SA node), and disorders of the atrioventricular node (AV node). With sinus node dysfunction (sometimes called sick sinus syndrome), there may be disordered automaticity or impaired conduction of the impulse from the sinus node into the surrounding atrial tissue (an "exit block"). Second-degree sinoatrial blocks can be detected only by use of a 12-lead EKG. It is difficult and sometimes impossible to assign a mechanism to any particular bradycardia, but the underlying mechanism is not clinically relevant to treatment, which is the same in both cases of sick sinus syndrome: a permanent pacemaker. Atrioventricular conduction disturbances (AV block; primary AV block, secondary type I AV block, secondary type II AV block, tertiary AV block) may result from impaired conduction in the AV node, or anywhere below it, such as in the bundle of His. The clinical relevance pertaining to AV blocks is greater than that of sinoatrial blocks. Patients with bradycardia have likely acquired it, as opposed to having it congenitally. Bradycardia is more common in older patients. Beta-blocker medicines also can slow the heart rate and decrease how forcefully the heart contracts. Beta blockers may slow the heart rate to a dangerous level if prescribed with calcium channel blocker-type medications. Bradycardia is also part of the mammalian diving reflex. A diagnosis of bradycardia in adults is based on a heart rate less than 60 BPM. This is determined usually either by palpation or electrocardiography. If symptoms occur, a determination of electrolytes may be helpful in determining the underlying cause. Bradycardia in an adult is any heart rate less than 60 beats per minute (BPM), although symptoms usually manifest only for heart rates less than 50 BPM. The treatment of bradycardia is dependent on whether or not the person is stable or unstable. If oxygen saturations are low, supplemental oxygen should be provided. Emergency treatment is not needed if the person is asymptomatic or minimally symptomatic. If a person is unstable, the initial recommended treatment is intravenous atropine. Doses less than 0.5 mg should not be used, as this may further decrease the rate. If this is not effective, intravenous inotrope infusion (dopamine, epinephrine) or transcutaneous pacing should be used. Transvenous pacing may be required if the cause of the bradycardia is not rapidly reversible. In children, giving oxygen, supporting their breathing, and chest compressions are recommended. CDC reported in 2011 that in the U.S. 15.2% of adult males and 6.9% of adult females had clinically-defined bradycardia (a resting pulse rate below 60 beats per minute). Daniel Green holds the world record for the slowest heartbeat in a healthy human, with a heart rate measured in 2014 of 26 BPM. Martin Brady holds the Guinness world record for the slowest heart rate with a certified rate over a minute duration of 27 BPM. Professional cyclist Miguel Indurain had, during his career, a resting heart rate of 28 BPM. The word "bradycardia" is from the Greek βραδύς, bradys "slow", and καρδία, kardia, "heart". ^ "Types of Arrhythmia". 1 July 2011. Retrieved 19 March 2015. ^ a b c d e f g h Allan B. Wolfson, ed. (2005). Harwood-Nuss' Clinical Practice of Emergency Medicine (4th ed.). p. 260. ISBN 978-0-7817-5125-4. ^ Ward, Bryan G.; Rippe, J.M. (1992). "11". Athletic Heart Syndrome. Clinical Sports Medicine. p. 259. ^ "AV Junctional Rhythm Disturbances (for Professionals)". American Heart Association. 4 December 2008. Retrieved 15 December 2009. ^ a b "Arrhythmias and Conduction Disorders". The merck Manuals: Online Medical Library. Merck Sharp and Dohme Corp. January 2008. Retrieved 16 December 2009. ^ a b Adams MG, Pelter MM (September 2003). "Ventricular escape rhythms". American Journal of Critical Care. 12 (5): 477–8. PMID 14503433. ^ a b Ufberg, JW; Clark, JS (February 2006). "Bradydysrhythmias and atrioventricular conduction blocks". Emerg. Med. Clin. North Am. 24 (1): 1–9, v. doi:10.1016/j.emc.2005.08.006. PMID 16308110. ^ Michael Panneton, W. (2013). "The Mammalian Diving Response: An Enigmatic Reflex to Preserve Life?". Physiology. 28 (5): 284–297. doi:10.1152/physiol.00020.2013. ISSN 1548-9213. PMC 3768097. PMID 23997188. ^ a b c d e f g Neumar RW, Otto CW, Link MS, et al. (November 2010). "Part 8: adult advanced cardiovascular life support: 2010 American Heart Association Guidelines for Cardiopulmonary Resuscitation and Emergency Cardiovascular Care". Circulation. 122 (18 Suppl 3): S729–67. doi:10.1161/CIRCULATIONAHA.110.970988. PMID 20956224. ^ Atkins, DL; Berger, S; Duff, JP; Gonzales, JC; Hunt, EA; Joyner, BL; Meaney, PA; Niles, DE; Samson, RA; Schexnayder, SM (3 November 2015). "Part 11: Pediatric Basic Life Support and Cardiopulmonary Resuscitation Quality: 2015 American Heart Association Guidelines Update for Cardiopulmonary Resuscitation and Emergency Cardiovascular Care". Circulation. 132 (18 Suppl 2): S519–25. doi:10.1161/cir.0000000000000265. PMID 26472999. ^ Yechiam Ostchega; et al. (24 August 2011). "Resting Pulse Rate Reference Data for Children, Adolescents, and Adults: United States, 1999–2008" (PDF). National Health Statistics Reports. Centers for Disease Control. Retrieved 15 December 2018. ^ "Slowest heart rate: Daniel Green breaks Guinness World Records record". World Record Academy. 29 November 2014. Retrieved 5 August 2015. ^ "Lowest heart rate". Guinness World Records. Retrieved 5 August 2015. ^ Lovgren, Stefan (20 August 2004). "Olympic Gold Begins With Good Genes, Experts Say". National Geographic News. Retrieved 8 September 2014. ^ Prutchi, David (2005). Design and Development of Medical Electronic Instrumentation. John Wiley & Sons. p. 371. ISBN 9780471681830.